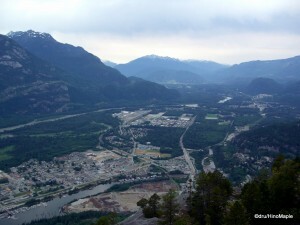 On my last trip to Canada, I spent an afternoon (June 30) going to Squamish and climbing the Stawamus Chief. The Chief is a granite dome mountain located next to Squamish. Squamish is a small town located about 1 hour North of Vancouver. It’s a beautiful town, but other than a stopping point for gas on the way to Whistler, there isn’t much to see. The main attractions for most people are along the highway, and they include McDonalds, Starbucks, White Spot, and Tim Hortons. When I say there isn’t much to see, I’m not joking. However, if you want to go camping, fishing, or hiking, the Squamish area is actually wonderful. The Chief itself is located just before you reach Squamish. The entrance is usually easy to spot, but also very easy to miss. Speeding is natural, so if you go too fast, you’ll pass it. Once you pass Horseshoe Bay, the next set of lights will be the Squamish area. Note that you have roughly 30-40 minutes to reach the next set of lights. 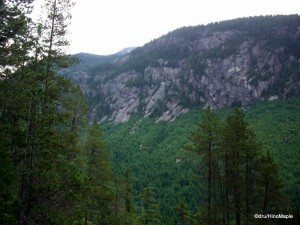 The hike itself is supposed to be similar to climbing up the Grind on Grouse Mountain. Basically, the hike is “nature’s stairclimber”, once you pass the campsite. The trail is a set of steps and natural rocks that form steps. A good hiker will be capable of climbing the mountain within 2 hours. I went up to the second peak, which is apparently the more popular peak. There is one rest area about halfway up the mountain and the view of the valley behind the mountain is wonderful. Near the top, you’ll meet a very interesting challenge. The path itself turns from natural stairs to chains and ladders to climb up a rock face. It would be dangerous in the rain, so be careful. The mountain itself isn’t that high. 702m to the third peak, but I only climbed to the second peak (655m). On the way up, I ran into a couple that took their dog up for a hike. The dog is an experienced hiker, and actually climbed onto the back of their owner as the owner went up and down the ladder! At the top, I enjoyed a nice sandwich lunch, enjoying the beautiful view. The view from the top allows you to see all of Squamish and Howe Sound. There were a lot of squirels and very few trees, but still relaxing and very peaceful. Upon reflecting on my previous hike up Mt. Fuji, I would consider this one to be more picturesque. However, there are lots of other mountains that have better views than the Chief or Mt. Fuji. Mt. Seymour is still my favourite hike in the Vancouver area. However, the time it takes to go up and down may not be for everyone. I found it harder due to the actual distance. The Chief is a relatively short, albeit straight up, hike. Hike around Cypress bowl is also nice, but you don’t get a city view. Just endless mountains. The Grind is nice, but with so many people, and a restaurant at the top, it doesn’t feel like a real hike. I would consider the Chief to be a relatively easy hike and a must do for those with lots of time in Vancouver. Note that if you are severely out of shape, do not try this hike. It is not the same as a walk in the park. This is a real hike. Bring about 1 litre of water, a lunch, and you’ll be fine. Good shoes are also nice, but not necessary. If you are more adventurous, and capable, the Chief is considered one of the best rock climbing mountains in the Vancouver area. Either way, enjoy the trip. This entry was posted in Canada and tagged dru, granite dome, hiking, Howe Sound, mountain, Squamish, Stawamus, Stawamus Chief, The Chief, vancouver by Dru. Bookmark the permalink.